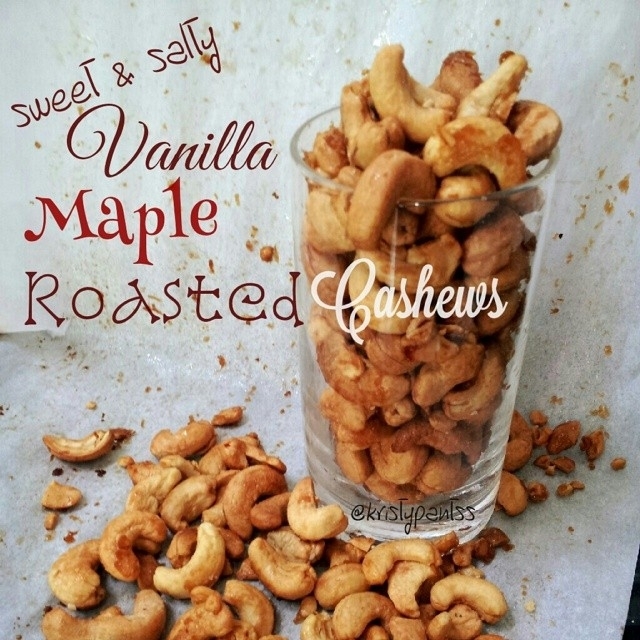 A deliciously sweet and salty snack without the added nasties and refined sugars in the commercial version. Whip them up in just minutes! For the cashews; mix 1T coconut oil (or butter), 1T maple syrup, 1/4t vanilla extract and a dash of himalayan salt. Pour mixture over 2 cups of cashews (I had just slightly less..I ran out!). Toss and make sure cashews are evenly coated. Bake at 300 until cashews turn a light golden brown. Could be 10-20 mins. Keep an eye on them! Noone wants burned cashews!! Be sure to turn OFTEN to make sure they roast evenly. Remove from oven and let cool. If you like the sweet & salty thang.. sprinkle with more himalayan or sea salt before they cool. Enjoy!